Decorating your mantel for Christmas is one of those things that just seems more special than decorating other places in the home. (Except the tree!) I think that’s because we associate the fireplace and mantel with warmth and the gathering of family…and also, if you have a fireplace, it’s likely the focal point in a room! 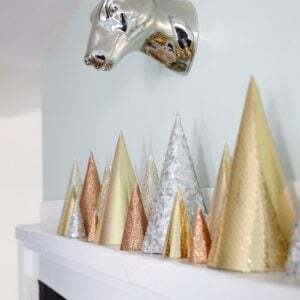 So this post, dear TBD readers, is the ultimate in holiday inspiration… DIY Christmas mantel decorating ideas and tutorials! Oh, and on a budget! First, remember to strip your mantel of its year round decor, if possible. Start with a clean slate… If some of your regular decor fits back in, great! If not, you won’t be trying to create a holiday scheme around items that don’t work. 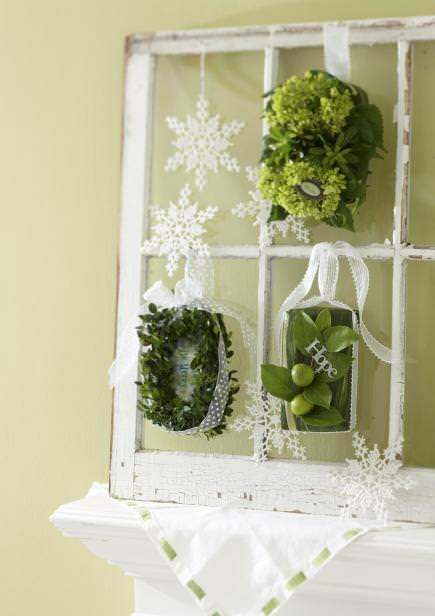 Second, start with greens, or whatever garland type filler you plan on using. This is your background “fill” and gives your arrangement a full and luscious holiday feeling. Lastly, add stockings! 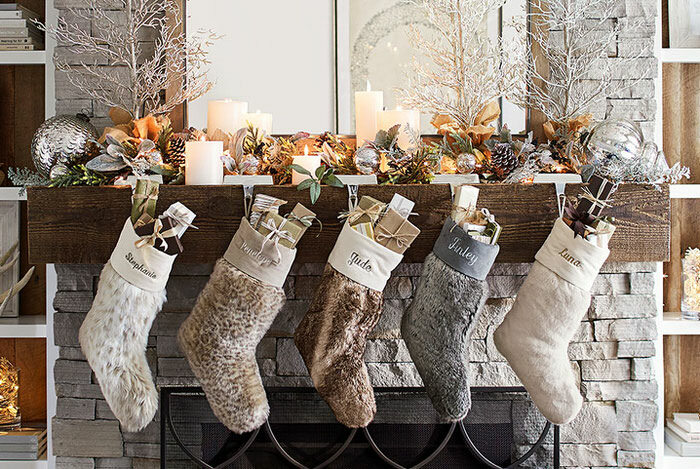 What Christmas mantel is complete without stockings! Needs ideas? 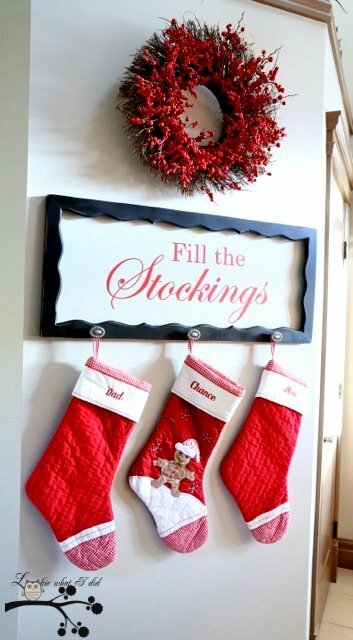 Then run over to our post, DIY Christmas Stockings and find tutorials there! Now that you have the basics, here is the fun part…inspiration! 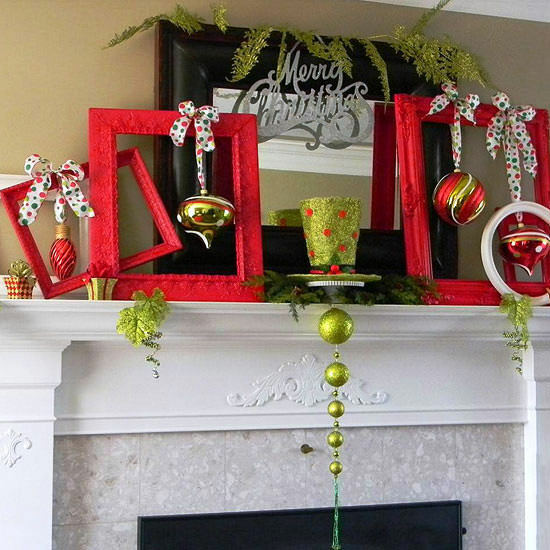 Don’t try to copy one of these mantels piece for piece, that’s not what the holidays is about. 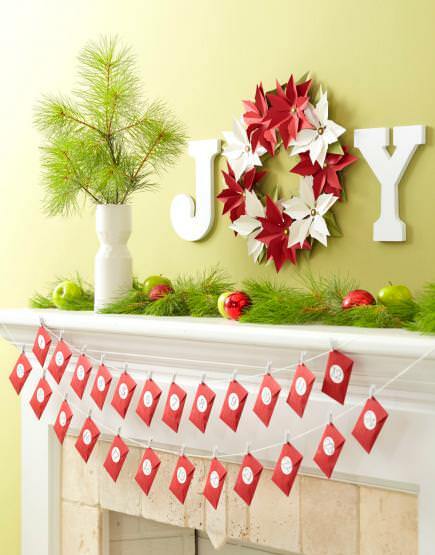 Take bits and pieces and ideas here and there, and blend them together for your own Christmas creative mantel. 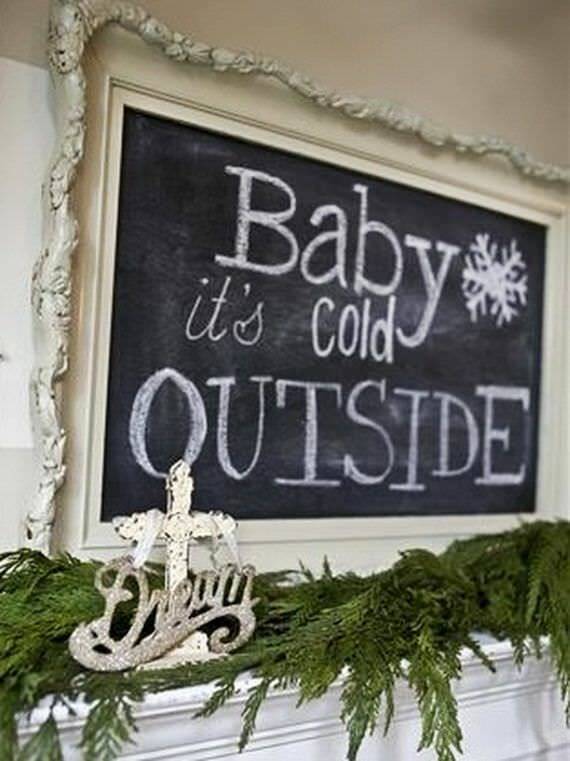 Diane at ‘In My Own Style‘ created this Let It Snow” mantel decor, and it is so pretty, yet simple! 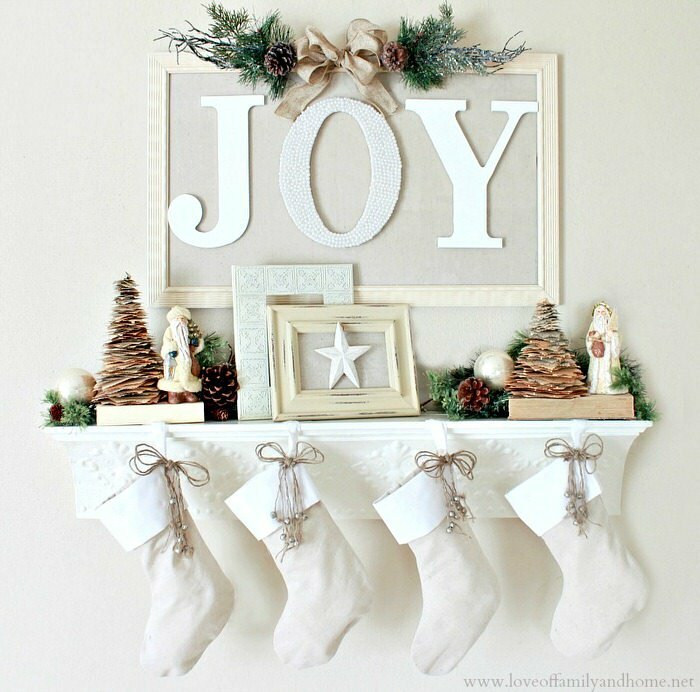 She has a complete tutorial for the signage, and lots of tips for styling s Christmas mantel! 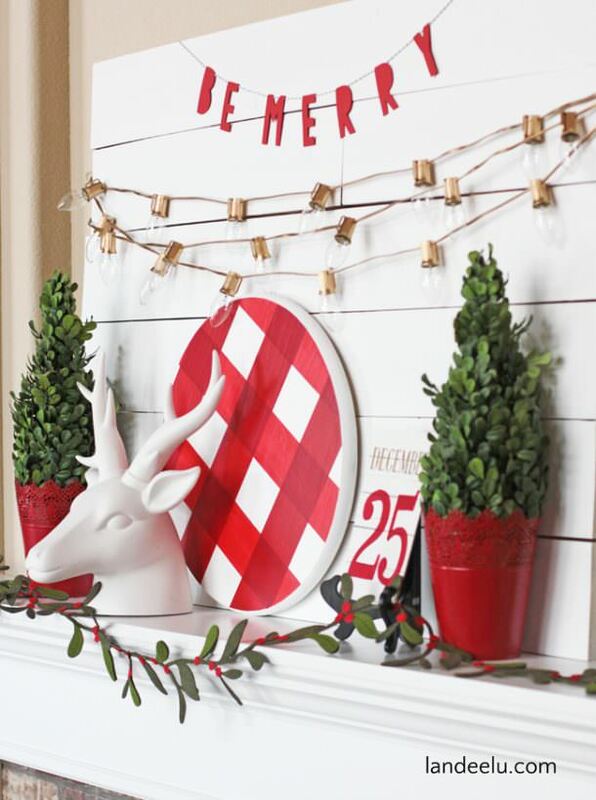 Chelsea at ‘Two Twenty One‘ created this classic Christmas mantel with her very own buffalo check wall decor DIY! We love this mantel so much! Jump on the buffalo check trend with ‘LandeeLu‘ and try every single one of her warm and fun mantel decorating ideas here! Love this! 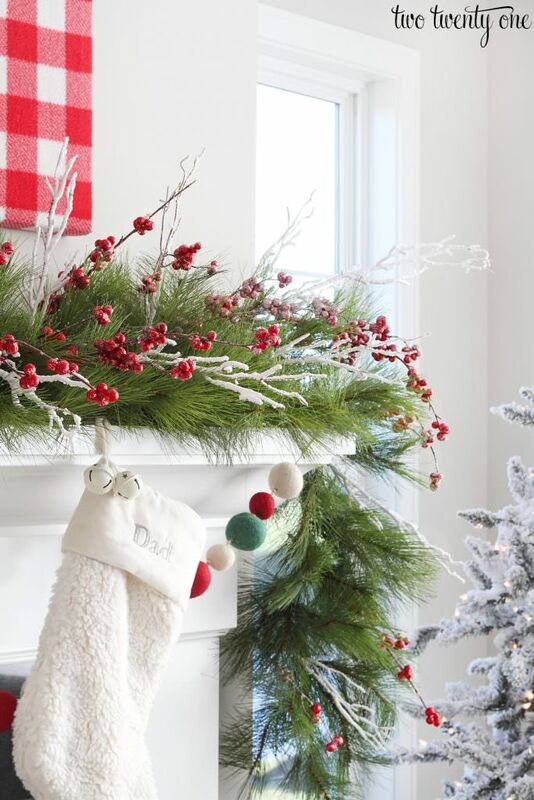 This Christmas mantel decorating idea is as calm and quiet as a snowy Christmas Eve, but so special! I adore this look and think the pop of pastel was a perfect touch. 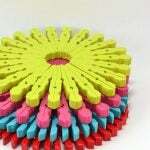 Great ideas from ‘Kristy Wicks‘! 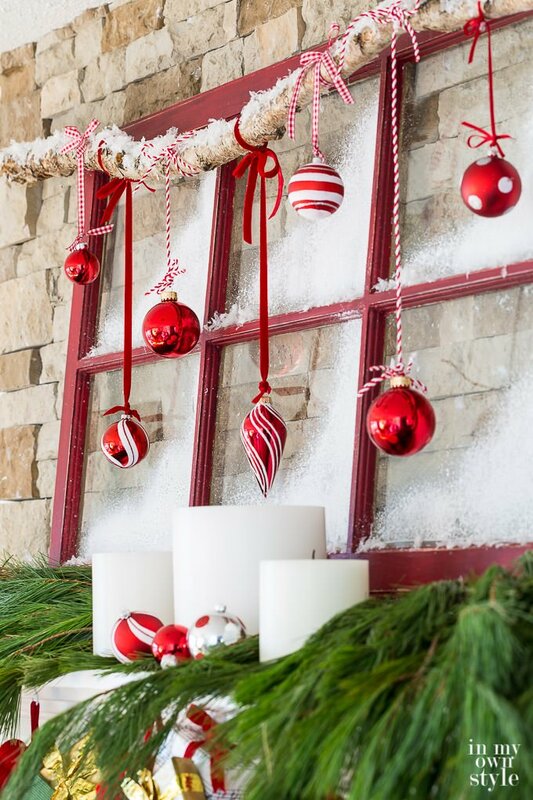 Make these frosted window panes for your Christmas mantel decorating with Diane from ‘ In My Own Style‘. Great instructions for this easy project! 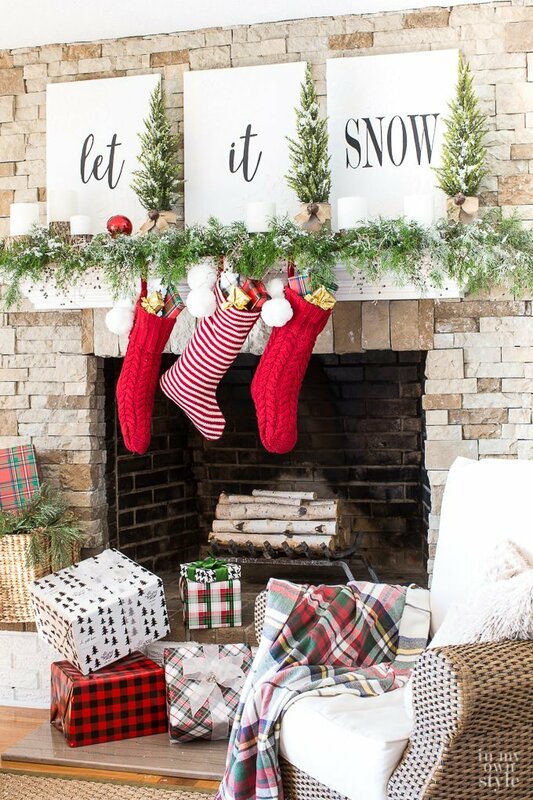 This inspirational Christmas mantel idea from HGTV is one I have used in my own home… I am still a little obsessed with chalkboards! My plan next time is to paint an old frame white, add a little glitter paint, then paint mdf or thin plywood with the chalkboard paint and frame it. This will be my statement piece! 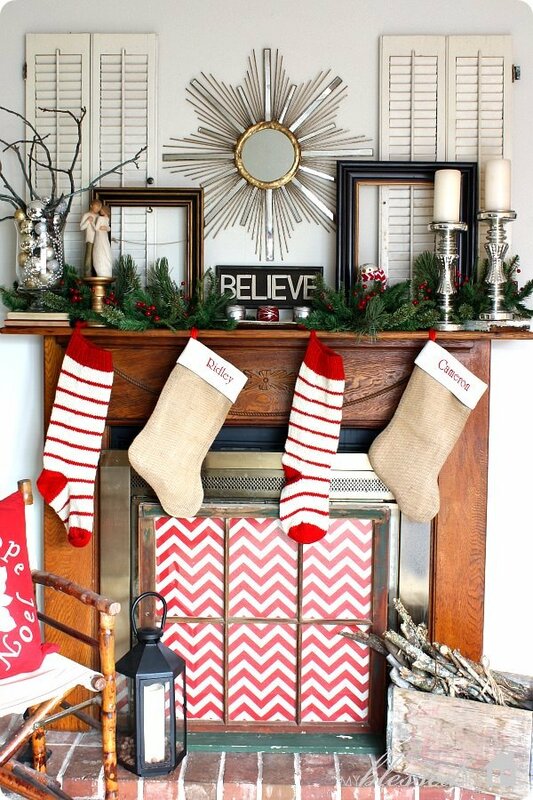 Meg from ‘Green with Decor‘ created this easy Christmas mantel idea in a more traditional style. 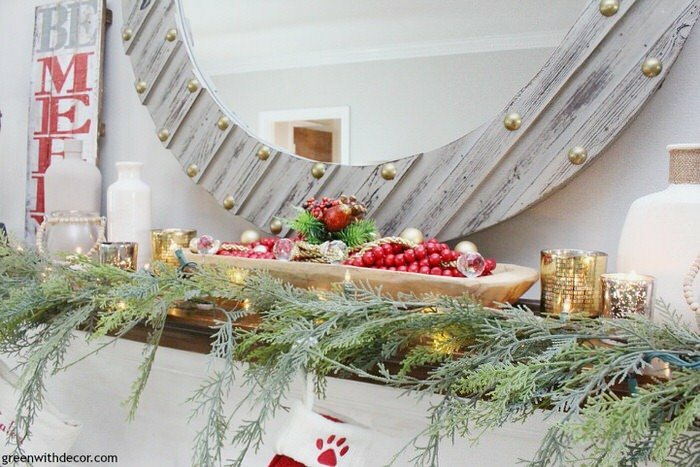 Her round mirror is amazing and really makes the mantel decorations pop. You will see a theme here on these tutorials with the mirror thing, for good reason. (It doubles everything!) 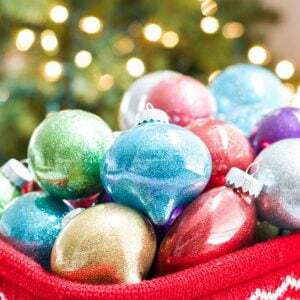 Love the wood bread bowl filled with Christmas baubles… Easy and cheap! 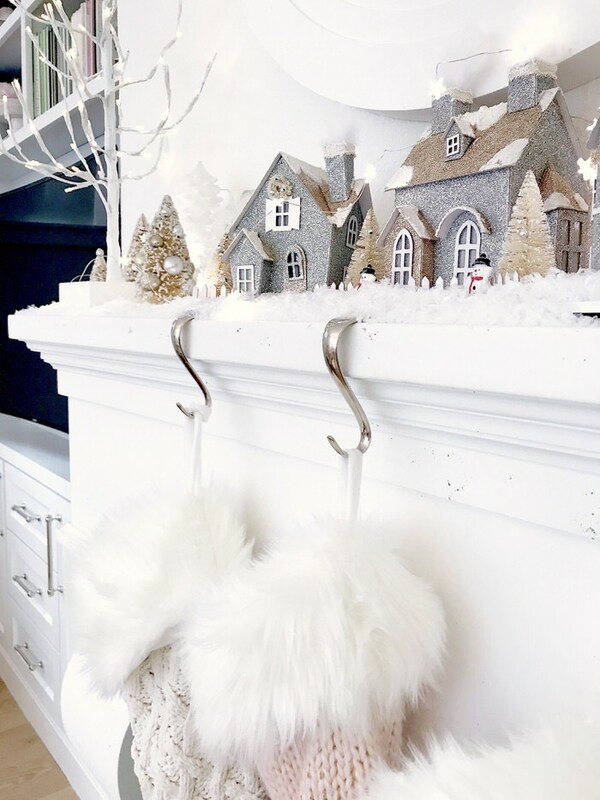 From Jennifer at ‘The Magic Brush Inc.’ are these mantel decorating ideas that use inexpensive craft store finds mixed with things she already had. 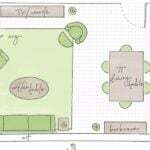 Our fav part of this design? The old garden gate she used as a rustic backdrop! Another example of a good budget minded statement piece for your mantel decorating, and the greens could come from your yard or tree trimmings… or even fresh herbs from the grocery store… From Midwest Living. Also from ‘Midwest Living‘, this mantel decorating idea includes a simple advent calendar you can make and use as a garland. Use small red envelopes and scrapbooking clothespins to create a little treat for each day! 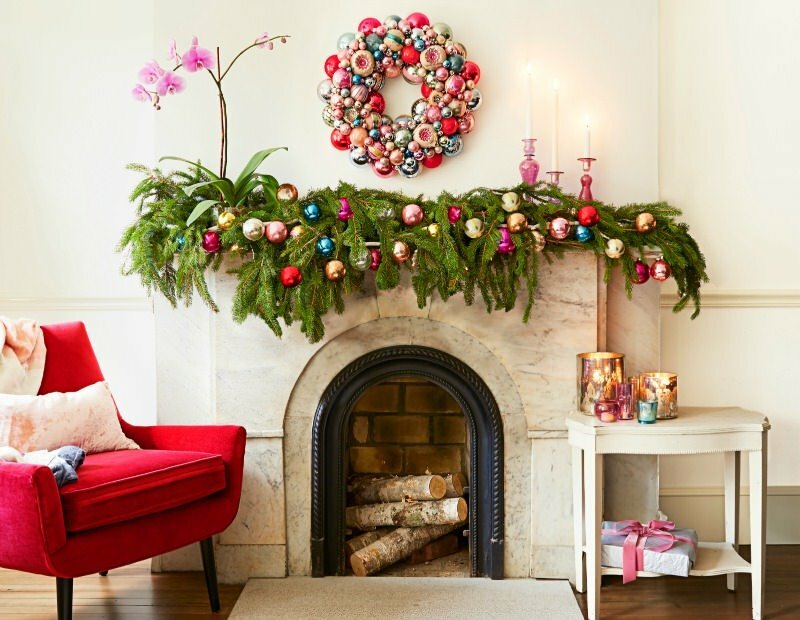 This nature inspired cozy luxe Christmas mantel decorating idea from ‘Pottery Barn‘ could be easily done by a DIY’er. Take note of the mirror leaning against the wall… That reflection of the candles and the greenery makes the space sparkle. Make sure any natural items you use don’t come in contact with the candles, or better yet, use flameless candles! Easy! Myra at My Blessed Life has a great budget mantel idea to inspire you…empty frames (could be spray painted in holiday colors, white, or soft glitter? ), a vase full of branches and leftover ornaments and bead garland, some extra candle-holders, a cake topper and a hand painted “Believe” sign. 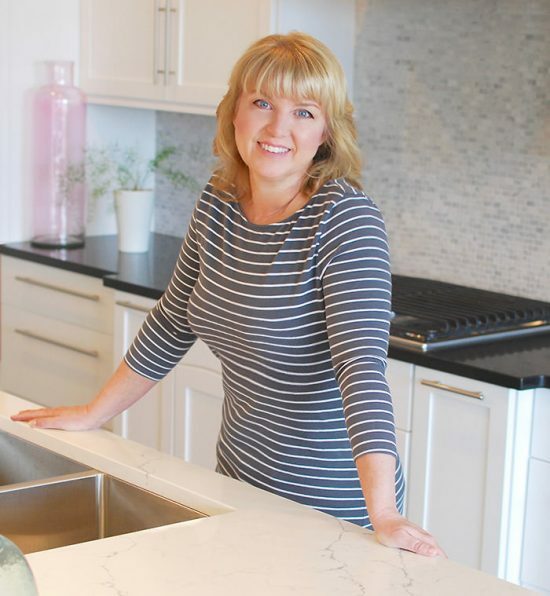 Better Homes and Gardens showcased this mantel! ‘Good Housekeeping‘ knows just how to use millennial pink in a Christmas theme! This Christmas mantel idea is really simple… a greenery garland, an ornament wreath and a couple of pink and metallic accents. Sophisticated, yet not stuffy! Terry at Forever Decorating had this great budget mantel decorating ideas… straight from the dollar store and thrift shop! Add spray paint and some glitter, and you have a very cool mantel! 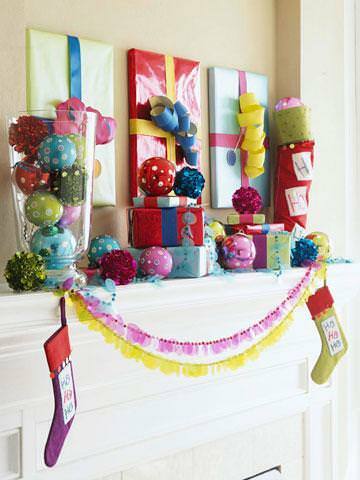 This colorful holiday mantel idea is easy to do on a budget… wrap picture frames as gifts, then fill vases and the mantel itself with colorful and bright balls… you can create painted balls, by drizzling paint into clear glass balls from the craft shop, turn the balls until the inside is coated, then let drain over a box until dry inside. Green and blue are my favorite colors, and I’m a nature girl, so this one just struck me… and so simple! 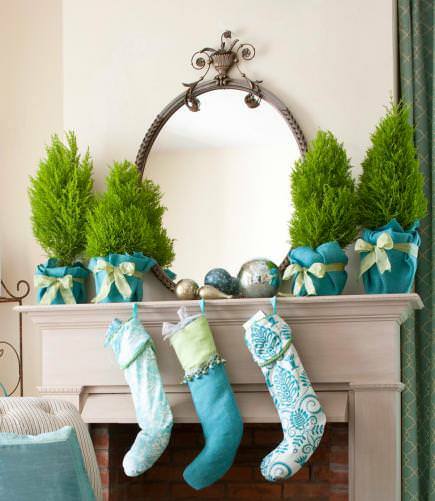 Wrap the bases of potted plants with fabric and ribbon, add some sparkly ornaments, and if it were me, I would add a few candles in front of that wonderful mirror as well! You don’t need many because the mirror effect will double the number of candles. This and the previous photo are both from ‘Midwest Living‘. Don’t have a mantel? Lookie What I Did has a no mantel decorating solution! 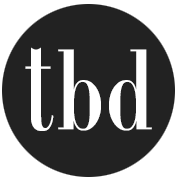 Share with us your creative ideas for Christmas mantel decorating ideas in the comments section below…maybe you will inspire one of your fellow TBD readers! Then try our post on our very own DIY Christmas Luminaria or DIY Christmas Cones! Beautiful! Full of fresh and exciting ideas. Thank you for sharing.